The paisley maize printed ITY Knit fabric features a collage of paisley designs that come together to form a beautiful pattern all throughout the fabric. This artistic pattern displays bright colors such as rust, orange, brown, turquoise and khaki. These colors situate together perfectly to form this beautiful abstract paisley design. ITY fabric (Interlock Twist Yarn) is 58" wide, 8oz per linear yard with a luxuriously rich 90% polyester, 10% spandex fabric content. The ITY is a breathable knit stretch jersey with an elegant matte finish. It is a vertical 2-way stretch fabric with a slight horizontal mechanical stretch. The ITY is prominently known for its beautiful flowing drape. It has a comfortable texture with visible soft knit ridges that give the fabric a prominent look and feel. The ITY's polyester fabric content allows the fabric to be easily washed, making it extremely versatile. 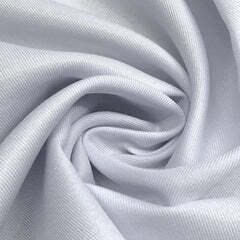 If you are looking for a stretch fabric to make soft and flowy year-round dresses, this fabric is an excellent choice. 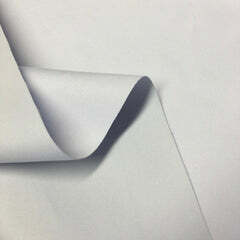 ITY is a stretch fabric, making it extremely versatile in its applications. 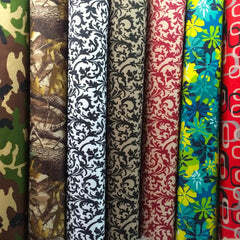 This fabric can be used for dresses, tops, dance outfits, apparel, leggings and many other crafts projects. 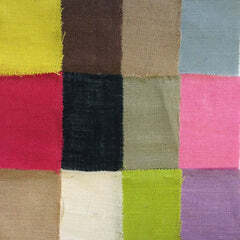 The extra width of this fabric also makes this fabric perfect for some draping and swagging projects as well. As always, we're stocked in thousands of yards to meet projects of any size. The yards per roll on the ITY range from approximately 60-80 yards. It is sold by the yard with competitive quantity based pricing and no minimums.